The Dyna and Toyoace were released in 1959 in the middle of Japan's high growth period as the Japanese economy achieved dramatic growth. Japan was brimming with vitality as it everywhere experienced a wave of industrialization, the source of its energy changed from coal to oil, and industrial complexes sprouted up along the Pacific coast.Cars supported the Japanese economy at its base. Dyna and Toyoace played a role, and have continued their work for over 50 years. 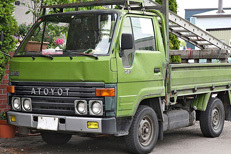 Dyna and Toyoace had a model change in June 2011 and were equipped with further evolved environment friendly capabilities. Dyna is a light, conventional truck that Toyota produces. There are not only models with a maximum loading capacity of 1 ton and 2 ton, but also a 3 ton model. There are 2 ton panel vans, flat bodies, dump trucks, and a car carrier truck with a 3 ton maximum loading capacity in the line-ups of rental businesses such as Toyota Rent-a-Lease. However, following changes to the licensing system on June 2nd, 2007, some Dynas may no longer be operated with the new ordinary license. Among the 3 ton trucks there are not only car carrier trucks, but also flat bodies that are as short as the 1 ton trucks. Drivers with a new ordinary license cannot use the Dyna T4 Class at Toyota Rent-a-Lease.Toyota improved the Dyna and Toyoace 2 ton capacity series in 2009 and released them on December 1st.Some models with the N04C-TJ diesel engine were given the N04C-UE diesel engine which achieves higher torque through a lower revolution rate. This improved the fuel consumption from 0.9 km/liter to 10.4 km/liter, allowing the trucks to comply with the 2015 fuel economy standards. 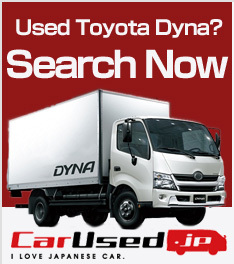 Copyright © About Toyota's Used Truck, The Dyna All rights Reserved.